Our Capstone research is coming to an end! Soon we will go on to presenting and then it’ll be done! But there are two important things that we have to do before we finish our research; the site visit and interview. The site visit and the interview are ways to help you gather extra research on your topic that you are doing. They are requirements to complete Capstone properly. I think that the site visit and interview are the most stressful parts of Capstone. For my site visit, I had to search through tons of places, finally decided upon the perfect one and for my interview, I had to email a lot of people and had to wait for a long time for a response. 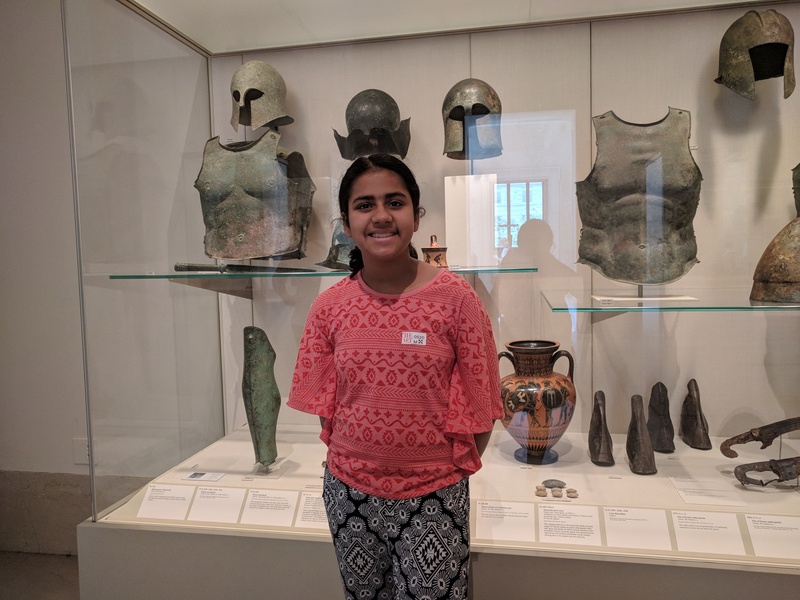 When I first heard about this, I was a bit nervous because my topic was Sparta, an Ancient Greece civilization so I didn’t know where to go for my site visit. But my teacher suggested a museum or a restaurant. I looked at a lot of museums but nowhere was too close by and related to my topic. It was a bit stressful when I was searching, but finally I found the perfect place to go. I decided upon the Metropolitan Museum of Art. I talked to my parents and they thought that the MET would be a great place to visit. At first I was nervous that they’d forget and I’d never go, but that didn’t happen. My family was really helpful with this and they took me on a weekend to NYC. The minute I came into the Greek section, I started to second-guess my thoughts on coming to the MET. 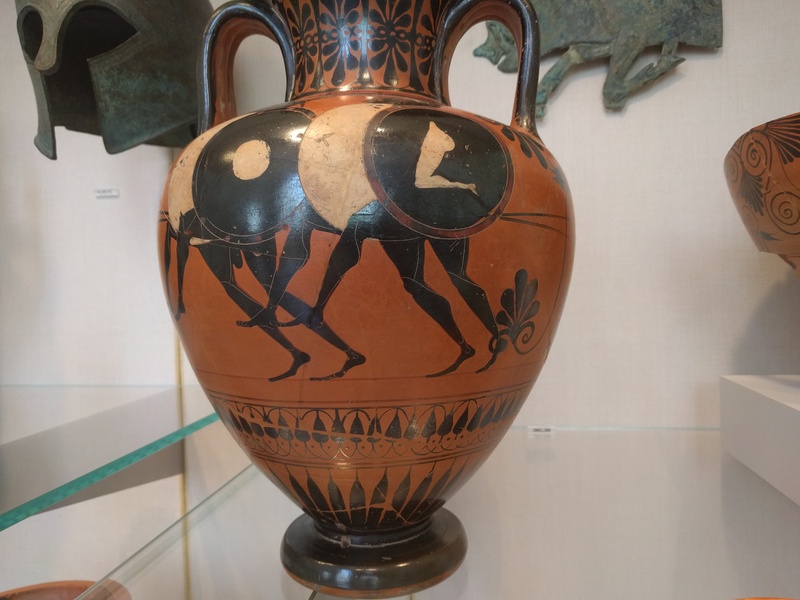 Sparta was a warrior society, not an artistic one. There were about two artworks that even mentioned the word ‘Sparta,’ in them. It’s rival state, Athens, was an artsy one though. 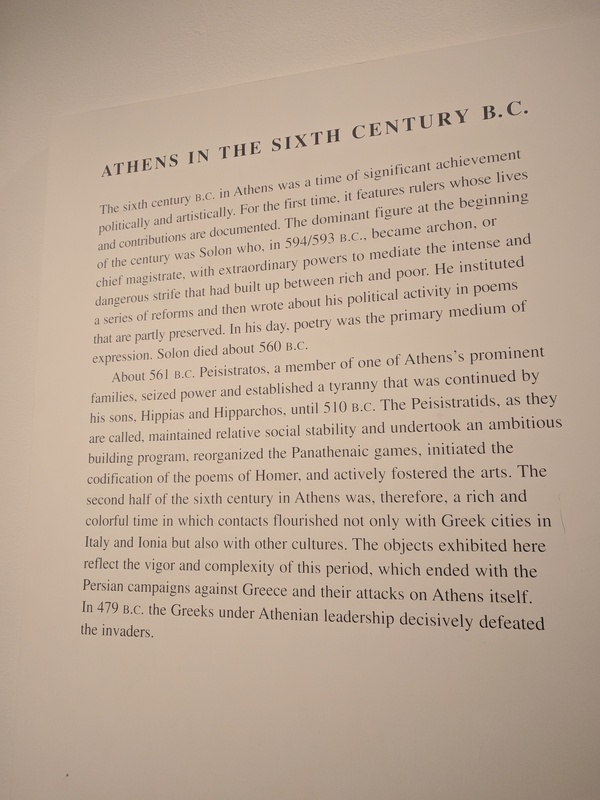 So I learned more about Athens and its decline of power, through it learning a bit about Sparta. But the main thing about our site visit is to take pictures. So I photographed armor and vases that had war scenes on them. There were a lot, so tons of pictures were taken. I also found some maps that gave me nice ideas of Spartan territories and information about the Athens-Spartan rivalry. I learned that Sparta’s victory in its battle of Athens completely devastated Athens. 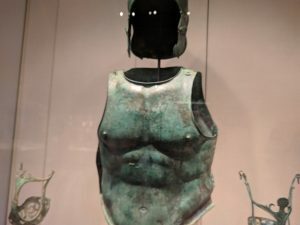 I also learned what types of armor warriors used and why. Fun fact: Armor was heavy so it made it hard to walk and you couldn’t flee. Instead it only gave protection. This was because Spartans didn’t believe in running away from battle. I came to the museum not expecting to get too much, but I got a lot of information. The best part was, though, that I got to explore other exhibits like the Chinese one which I’ve always loved. So I’d definitely say that my visit to the MET was a success. These are examples of the armor that I saw. This is me at the museum. These are examples of the vases I saw. 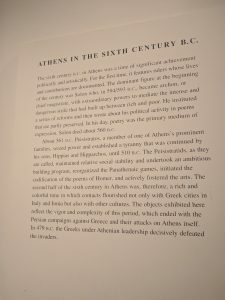 This is what I learned about Athens during my visit to the MET.